As we approach the one year anniversary of the explosions at the Port of Tianjin, China, a new report finds that a port’s size and its catastrophe loss potential are not strongly correlated. Based on the 1-in-500 year estimated catastrophe loss for earthquake, wind and storm surge perils, the surprising analysis by catastrophe modeler RMS, shows that it’s not just the biggest container hubs around the world that have a high risk of insurance loss. 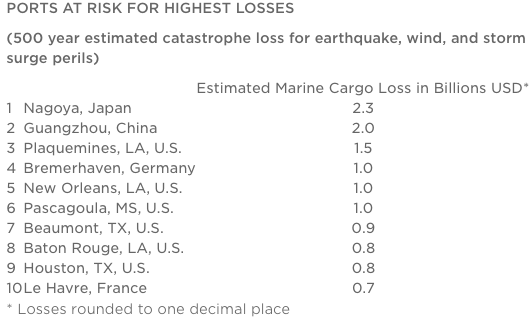 For example, smaller ports such as the U.S. ports of Plaquemines, Louisiana, and Pascagoula, Mississippi, as well as Bremerhaven, Germany rank among the top 10 ports at highest risk of marine cargo loss. RMS’ analysis shows the riskiest two ports are in Japan (Nagoya – $2.3 billion) and China (Guangzhou – $2 billion), and that six of the top 10 riskiest ports are in the U.S., with the remaining two in Europe (see chart below). The findings come after four years of marine catastrophes which have generated billions of dollars in marine insurance losses: 2015 Tianjin explosion (more than $3 billion); 2012 Superstorm Sandy (est. $3 billion marine loss, of which approximately $2 billion cargo loss); and the 2011 Tohoku earthquake and tsunami. The Tianjin loss ranks among the largest man-made insured global loss events in history, with an estimated total insured property loss of up to $3.5 billion. To conduct its analysis RMS marine risk experts used the new RMS marine cargo model, which takes into account cargo type, precise storage location, storage type, and dwell time to determine port exposure and accumulations. RMS suggests that better data and modeling are key for more effective portfolio management and underwriting. Check out Insurance Information Institute facts and statistics on man-made disasters here. The explosions at the Port of Tianjin, China are set to become one of the largest insured manmade losses in Asia to-date with potential losses of up to $3.3 billion, according to a new report by Guy Carpenter. The event, which blasted shipping containers, incinerated vehicles in the port and on an adjacent highway overpass, destroyed warehouses, production facilities and dormitories, and impacted a nearby railway station and residential structures, will also be considered one of the most complex insurance and reinsurance losses in recent history. Many classes of insurance were impacted by the loss, including: containers; cargo in containers; property; auto; and general aviation. While access to the site is limited, Guy Carpenter said its satellite-based catastrophe evaluation service known as CAT-VIEW was able to utilize high resolution pre- and post-event satellite imagery to understand what exposures were present at the time of the blast and therefore could contribute to the loss. The findings come as a new study published by Lloyd’s says that manmade risks are having an increasingly significant impact on economic output at risk (GDP). In its analysis, Lloyd’s City Risk Index finds a total of $4.6 trillion of projected GDP is at risk from 18 manmade and natural disasters in 301 major cities around the world–out of a total projected GDP between 2015 and 2025 of $373 trillion. However, manmade threats such as market crash, power outages and nuclear accidents are associated with almost half the total GDP at risk. A market crash is the greatest economic vulnerability–representing nearly one quarter ($1.05 trillion) of all cities’ potential losses, Lloyd’s says. New and emerging threats such as cyber attack, human pandemic, plant epidemic and solar storm are also having a growing impact, representing more than one fifth of total GDP at risk, Lloyd’s reports. Governments, businesses and insurers must work together to ensure that this exposure–and the potential for losses–is reduced, according to Lloyd’s CEO Inga Beale. Lloyd’s research shows that a 1 percent rise in insurance penetration translates into a 13 percent reduction in uninsured losses–a 22 percent reduction in taxpayers’ contribution following a disaster. Insurance also improves the sustainability of an economy and leads to greater rates of growth. A 1 percent rise in insurance penetration leads to increased investment equivalent to 2 percent of national GDP, Lloyd’s notes. Check out the I.I.I. publication A Firm Foundation: How Insurance Supports the Economy. A New York Times article over the weekend takes a behind-the-scenes look at the recent deadly blasts at the port city of Tianjin in China. The series of explosions and fire that began at a hazardous chemicals storage warehouse in the Binhai New Area of Tianjin August 12, leveled a large industrial area, leaving at least 150 dead and more than 700 injured. As reported by the NYT, the lack of safety and oversight at the third largest port worldwide is shocking. The Tianjin catastrophe points to the fact that man-made disasters can have a major impact on a global scale. Warehouses, buildings, thousands of containers and new vehicles were destroyed in the blasts, according to reports. An initial estimate from analysts put the potential insurance loss at up to $1.5 billion. Some claims are likely to hit reinsurers, rating agencies say. The incident also highlights the growth of accumulation risks, particularly in highly industrialized areas, according to Dieter Berg, head of department business development, marine global partnership at Munich Re. He gave examples such as the destruction of a power plant on Cyprus in 2011 that impacted the national economy, as well as floods in Thailand in 2011 that brought conveyor belts to a halt worldwide. While insurers and reinsurers are focused on the large loss potential arising from natural hazards, such as flooding or hail, losses are often caused by human beings, particularly around industrial facilities, Berg added. Insurers and reinsurers need to fully understand the value of goods in ports and all potential exposures in order to calculate adequate premiums, he advised. The Insurance Information Institute (I.I.I.) has facts and statistics on man-made disasters here.